← On the cut and thrust of surgeons and conductors. Greetings Land lubbers. My grand-daughter Lucie is now in Cadiz, Spain having left Collingwood, Ontario on 26 August aboard the tall ship S.S. Sorlandet. She and 40 fellow students sailed up the St. Lawrence River to the Atlantic Ocean, arriving at their first port of call, Horta in the Azores. From Horta they finished crossing the Atlantic and sailed up the Tagus River to Lisbon Portugal, a total of 11,685 nautical miles in 51 days, with 24 of those days at sea. 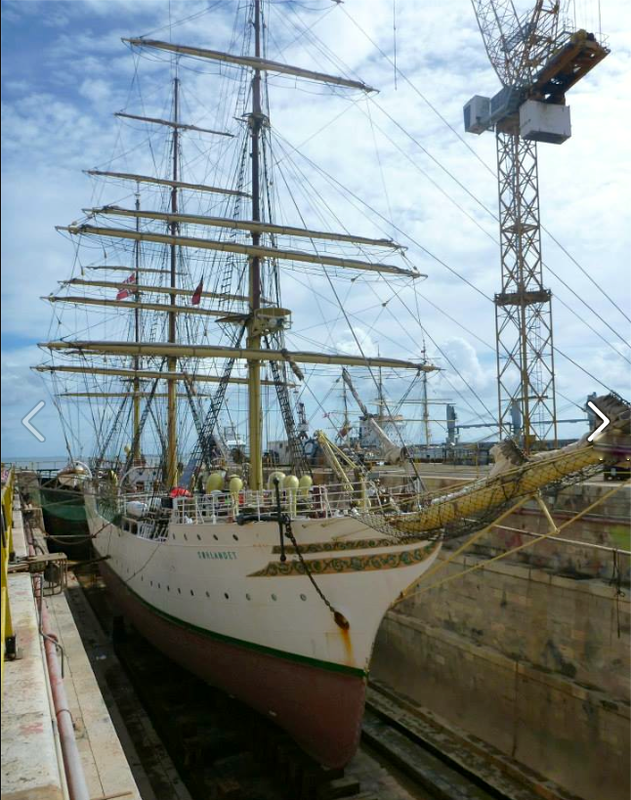 The Sorlandet entered dry dock in Lisbon to remove a fishing net intagled in its rudder, causing a small oil leak.. The entire vessel was visible to the students for the first time. S.S. Sorlandet in dry dock. Lisbon, Portugal. 20 October, 2013. During the Atlantic crossing, Sorlandet experienced 25 foot waves and winds which produced speeds up to 10 knots per hour. In the midst of this weather Jannik Rathke, an adventurous student decided to film his climb up rope ladders to the highest point on the ship. It’s an incredible journey worth seeing. Congratulations Janniik. His mother broadcast this uTube posting. I must write to ask her what she felt while viewing her son’s film for the first time. Right on my doorstep – the beautiful city of Lisbon!